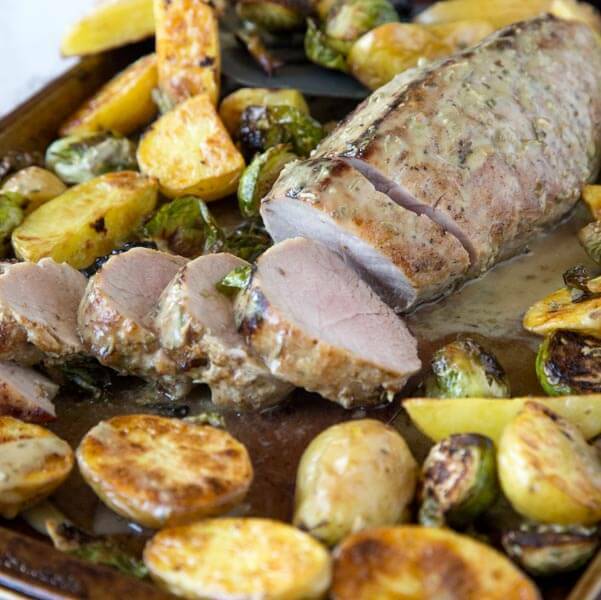 Sheet Pan Pork Tenderloin – tender and juicy pork tenderloin with Brussels sprouts, roasted potatoes and topped with a Dijon herb vinaigrette. 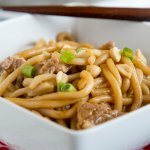 Ready quickly, super easy, and so good! We eat a lot of pork at our house. 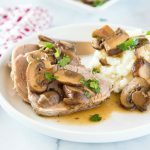 Pork tenderloin bruschetta is one of my favorites that I have not made in a really long time. 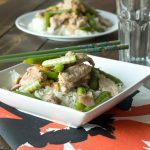 The pork is lightly breaded, baked, and then simmered in a sauce. And topped with cheese, because why not. But, I am always looking for new ways to mix it up. Like these French Onion Pork Chops. Do you have a favorite way to eat pork? There are so many cuts of pork, it can be hard to pick what you want. But I think pork tenderloin might be my favorite. 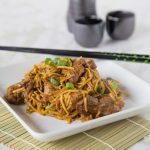 It is so tender and easy to cook. Plus it stays so juicy when you cook it. 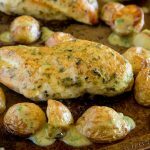 Do you remember the Sheet Pan Chicken with Roasted Potatoes I made a few months ago? It was so good, and so easy. Dinner made in about 20 minutes with perfectly crispy potatoes, juicy chicken and one killer sauce. Plus it is healthy. You can’t go wrong. Well today I am making a new version of that chicken with pork. 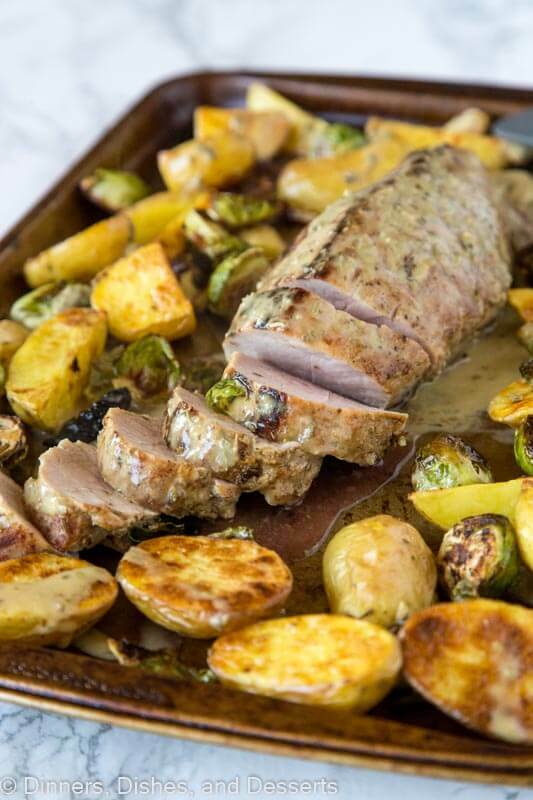 A sheet pan pork tenderloin. In a similar sauce that is so good you may want to just drink it. Plus I added veggies. You could really add whatever your family likes, but I used Brussels sprouts. Broccoli, cauliflower, asparagus…you name it, you could use it. 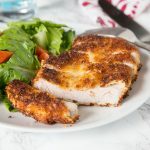 Pork tenderloin cooks very quickly, so I knew it would be perfect for this dish. As the potatoes started to cook in the oven, I seared the pork tenderloin on the stove top, so it could get the perfect caramelization you want. Then finish it in a super hot oven. You can have dinner done in about 25 minutes. 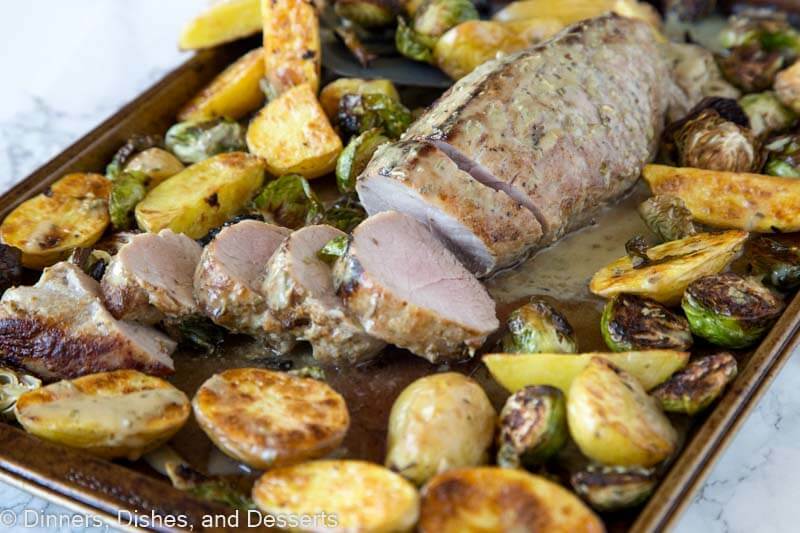 This sheet pan pork tenderloin is pretty enough you could serve it to guests. But it is so easy to make, you can have it on a Monday night as well. My family loves pork, we eat a ton of it. So this may become my new go to. I also love that you can mix up the veggies. I can have the Brussels sprouts I love, and the rest of my family won’t complain. 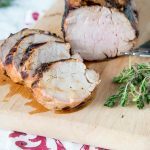 So the next time pork tenderloin is on sale at your store, pick one up! You will not be disappointed, trust me! 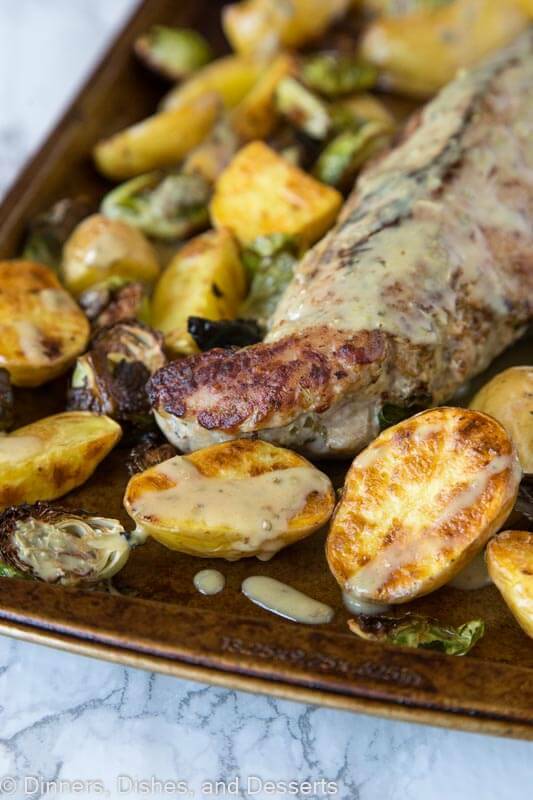 Sheet Pan Pork Tenderloin - tender and juicy pork tenderloin with Brussels sprouts, roasted potatoes and topped with a Dijon herb vinaigrette. 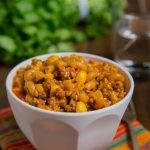 Ready quickly, super easy, and so good! Place a jelly roll pan in oven. Preheat to 500 degrees, leave the pan in there while it preheats. Remove pan and spray with non-stick spray. Add Brussesls sprouts and potatoes, and bake for 10 minutes. Meanwhile combine olive oil, mustard, oregano, wine, thyme and honey in a small bowl. Mix until well combined. Season pork tenderloin with salt and pepper. Heat skillet over medium high heat. Add canola oil to the pan, swirling to coat. Add pork and cook for 5 minutes. Flip and drizzle about 2 tbls of mustard mixture over the pork. 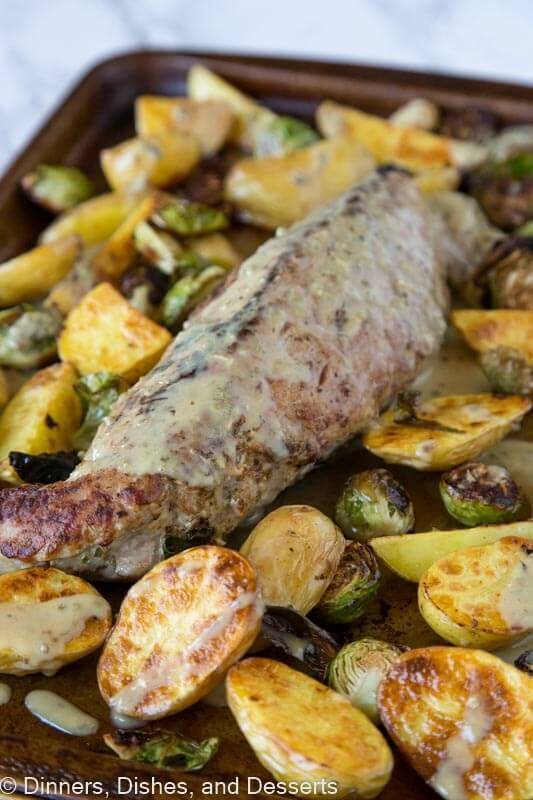 Once pork is browned, add to the jelly roll pan with the Brussels sprouts and potatoes. Return to the oven for 10-15 minutes, until the pork is cooked and the potatoes are tender. Drizzle the remaining mustard mixture over the pan and season with salt and pepper. 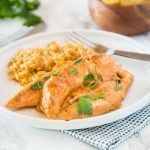 I love how easy these sheet pan dinners are to bring together! I am thinking of all the veggies I could add to this pan! Looks so festive! 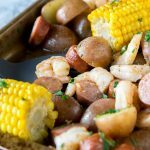 One of the best sheet pan meals, everything I love in one place! So perfectly tender and that sauce is exquisite! 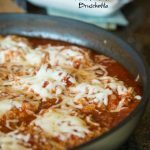 Such an easy and delicious meal!! I LOVE everything about this!! Easy recipe and easy clean up. 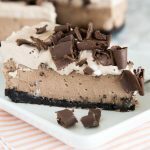 Oh, and we loved this recipe too! 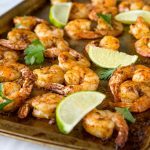 Sheet pan dinners are so awesome, easy to clean up, and the taste is amazing. Thanks!!! I LOVE everything about this!! 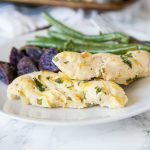 Its so easy and incredibly delicious!! YUM!! I love a good sheet pan meal. The vinaigrette sounds amazing! I love how easy it is to make! Looks really good! 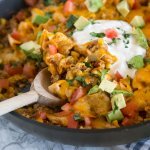 Such an easy and delicious one pan meal! Perfect for weeknights! 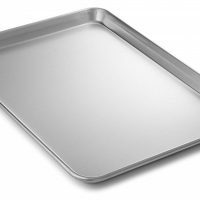 You totally sold me at sheet pan. It makes everything so much easier!